Little Bird Tales is a nice site intended for younger students to use to create digital stories. Little Bird Tales walks users through each step of creating a multimedia story. Users can upload images, draw images, or record from their webcams. Stories can be written with text or narrated by students using microphones connected to their computers. ZooBurst is an exciting free service for creating digital stories. ZooBurst allows users to create 3D pop-up books using nothing more than public domain clip art and ZooBurst's web-based editing tools. Users can view ZooBurst 3D books in augmented reality by enabling their webcams (click webcam mode) then clicking the ZB button present on each story. 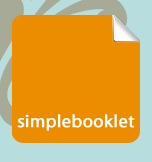 Simple Booklet is a free service offering online multimedia booklet creation and publishing. To create a book using Simple Booklet just sign-up for a free account and click create. Select the layout template that suits your needs. To add content click anywhere on the blank canvas and a menu of options will appear. You can add text, images, audio files, videos, and links to each page of your booklet. Each page of your Simple Booklet can have multiple elements on it. To include videos you can upload your own files or select from a variety of provides including SchoolTube, TeacherTube, YouTube, and others. To add audio to your pages you can upload your own files or again select from the online hosts Last.fm, Sound Cloud, or Mix Cloud. When you're done building pages in your Simple Booklet you can share it online by embedding it into a webpage or you can share the unique link generated for your booklet. My Ebook is a new service for creating rich multimedia ebooks. My Ebook allows users to create ebooks that contain text, images, and videos on each page. My Ebook users can create ebooks from scratch or upload their existing PDF files to display in a book format. When starting an ebook from scratch on My Ebook, users can import images from their Flickr, Facebook, Picasa, and Photobucket accounts or upload new images directly to My Ebook. If you don't have any digital images you can select some from My Ebook's gallery. Videos can also be embedded into the pages of My Ebook. My Ebook provides a good variety of themes and templates to give each ebook a different look and feel. Ebooks created using My Ebook can be embedded into blogs and websites or shared via email.